Over the holiday break, I installed a new mobile app called ‘Docphin‘ on my iPhone. It does a great job of searching multiple sources on various subjects. As my primary interest is in neuro-oncology, much of the articles and papers that I have found relate to gliomas. I also had general searches/ alerts related to cancer vaccines and virus based treatments. Needless to say, I had a plethora of material to read over the last two weeks. 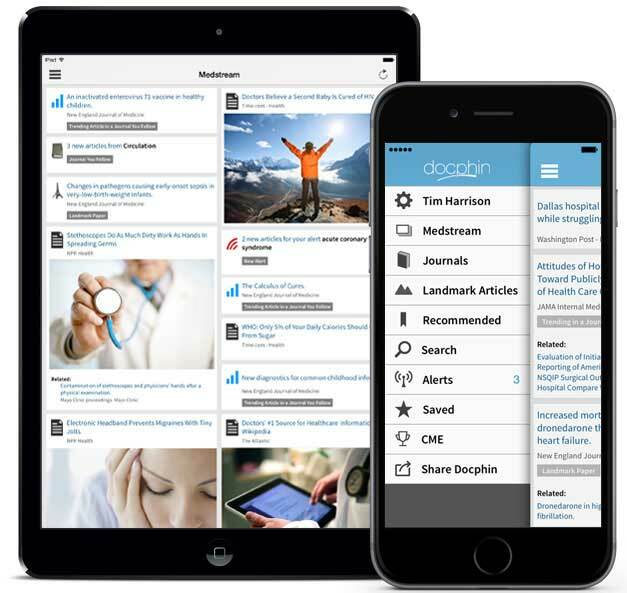 Medical Journals and Pubmed on your iPhone/ iPad. I enjoyed the app so much, that I shared it with family who were in town for our niece’s wedding. Obviously the family who were mostly interested in the app were doctors. We talked about how wonderful it would be if when opening a patient file, the Medical Records system also showed relevant articles or treatments that were published in the last six or so months. On a side note, I found an article from 2000 that was still very relevant. The article, Glioblastoma Multiforme: The Terminator, was written by Eric C. Holland with input from Susie’s neuro-surgeon, Dr. Raymond Sawaya. The article did an excellent job of explaining why ‘multiforme’ is part of the Glioblastoma name and how come surgical resection is insufficient when treating it. The Figure 2 progression images are just frightening. MRI scans of a patient with right temporal GBM illustrating the spread of the disease. (A) Presurgical scan, GBM (arrow). (B) Scan after surgery and radiation therapy showing “gross total resection” and clear resection cavity. (C) six months later, showing recurrence at resection margin (arrow) and second focus in frontal lobe (arrow). (D) Postresection scans of both recurrent tumors. (E) Scan 3 months later, tumor recurring at resection margin. More importantly, the article describes gene therapy along with virus/ viral based treatments and vaccines. These concepts back in 2000 were mostly theoretical research that was being explored in the laboratory (aka the bench). Now, we are seeing clinical trials based on these theories that have shown promise. We are talking about 10-15 years from inception. I wonder what is being thought about on the bench today and I hope the time to clinical trial/ market will be shortened. We need a John Connor to help MD Anderson, Mayo Clinic, Memorial Sloan Kettering, Cleveland Clinic and so many others defeat the GBM Terminator. I wonder if IBM Watson will become our John Connor, or if John is in a small research lab in San Diego, Haifa or Singapore just about to crack through the complicated and illusive shell of multiforme. Thanks for writing about Docphin. Very glad to hear you are finding it useful! Best wishes for 2015!